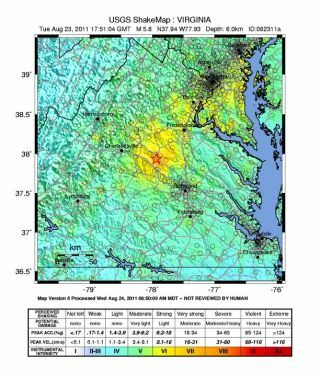 USGS shakemap showing he August 23, 2011, Virginia earthquake. While NASA often sets its sights on the heavens, the space agency is still affected by events here on terra firma — like yesterday's East Coast earthquake. The 5.8-magnitude temblor — the biggest quake in the region in more than 100 years — struck near the small Virginia town of Mineral yesterday morning (Aug. 23). It then radiated outward, shaking the ground in dozens of states. "Wow! An earthquake at NASA HQ in DC, and I thought technology was exciting..." NASA chief technologist Bobby Braun tweeted yesterday. Goddard Space Flight Center, in Greenbelt, Md., did not evacuate. However, Goddard did declare a "Code Red" at about 3 p.m. EDT yesterday. While that sounds scary, a Code Red simply closes the center to nonessential personnel. The quake does not appear to have caused any lasting damage to NASA's centers, assets or infrastructure, officials said. The main impact may have been shock or surprise. Goddard personnel, for example, are trained to deal with blizzards and hurricanes — typical East Coast scenarios. "I can tell you, we don't exercise often to prepare for an earthquake," said Ray Rubilotta, deputy director for management operations at Goddard. "Even if there's not another big quake for 100 years, we'll definitely have an earthquake checklist now," Rubilotta told SPACE.com.